Sarah is experienced and well versed at executing commissioned tasks; from small coffee table pieces to monumental statues. She works closely with her client to creatively express their vision in the bronze works she sculpts. All prices will be quoted in South African Rands unless otherwise requested. The classical image of the Bull and Bear is often used to illustrate the stock exchange fluctuations. The bull is based on the bull of the famous Wall street large bronze and the Bear my own interpretation. This is a sculpture well suited to be placed in the boardroom or on an office table. Full edition sold exclusively to the Nedbank Golf Challenge This sculpture was created especially for the Nedbank Golf challenge 2006 as gifts for the players and the VIP's. Each sculpture was packaged in a custom made wooden box, for safe transport and professional presentation. 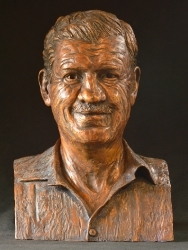 This bronze bust of Mr Reddy was commissioned by the Reddy family to be kept at the school in Chatsworth, Durban, KZN South Africa to commemorate his initiative in starting this school called Bayview school, over 60 years ago. This sculpture was created for the new memorial garden at Clifton school in Nottingham Road in the KZN Midlands. The sculpture depicts a boy running and playing with his ball. A happy reminder of those children lost to the school for various reasons. Click here to view more photos of the sculpture. The title of the work is from a famous quote of Henry David Thoreau (full quote below). As I was working on designing, painting and placing the fish into its massing swirl, I found myself thinking how humans behave in such similar ways. We follow other people and our 'so-called leaders blindly. We head in a direction that does not ultimately get us anywhere. And when something bad happens to us we cluster together, panic and then just repeat our mistakes again - over and over. Small trophies and medals can be commissioned as yearly ongoing prizes for a company. The Buffalo Hunter was commissioned by a group of hunters. It is a closed edition of 6. Although the artists proof is still available, on order. This sculpture was commissioned by the Natal Cane Growers Association, to be placed at the KwaDukuza library in Stanger. The sculpture commemorates the courage and fore-site of the Indian indentured labourers brought to Natal in 1860, 152 years ago, to work in the cane fields. These men and women built a community from nothing; educating and creating business, while fulfilling their contract to the Cane owners who shipped them to South Africa. The community in Stanger now have a monument to remind and educate the youth of today about their origins. This double portrait bust sculpture was commissioned by the Bhagwandeen family in appreciation and respect of their parents who started a shoe factory in Pietermaritzberg KZN South Africa.